The task of finding a guitar that fits your specific needs is a little bit daunting, especially for beginners. You have to figure out the technical details, know your budget, know what style you want to play (at least, more or less) and then go through hundreds of models to figure out which one is the best. The beginner’s guitar market is vast beyond belief and a lot of them are great. Fender Beginner Acoustic Guitar MC-1 ¾ Nylon String guitar is definitely one of the better options for beginners that is also offered at quite a nice price. So let’s get into it. 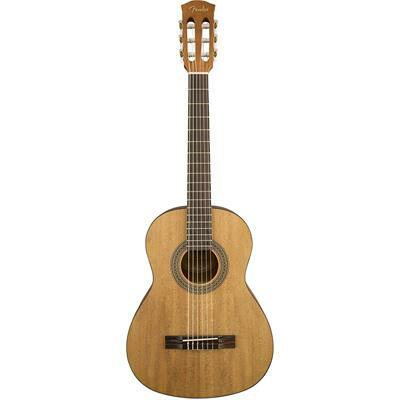 The MC-1 ¾ nylon string is a smaller sized version guitar, making it easy to play and control. Easy-of-use is one of the biggest factors to consider if you are just starting your journey in the music world. Sometimes smaller sized guitars do not have the same volume and sound as the full-sized versions and that is just a given. BUT you can still find models that emulate the sound the closest. The key to great sound is the tonewood and this model has some decent material that will enhance the sound and create great tone. The top is laminated Agathis while the back and sides are laminated Sapele. Agathis and Sapele are not the most renowned materials. You can definitely get guitars with better tonewood but they will cost a lot more. Overall, I do not think that Agathis and Sapele are bad for the sound, actually, these two materials come together very well and produce sweet, warm tone. Of course, if you are a well-seasoned player you will notice a difference in sound but for a beginner, these materials are a great start. I would not say that they are the most durable materials but then again if you want a guitar for your first steps and do not want to invest too much money this might be one of your options. The neck is made from Nato with Satin finish. Overall, I would not say that the tonewood is the top-notch material but for the price you are giving, this guitar offers decent material that provides nice sound and tone. Fender has equipped this beginner model with synthetic bone nut, a nice substitute for the world-renowned and beloved bone nut. Tuners are open Gear Machine Heads with Pearloid Buttons that provide stable intonation and the model is shipped with Fender Nylon Classical 100, Clear, Tie End Strings, (.028-.043 Gauges) which are very decent medium gauge strings. For a beginner, the medium gauge is a better option. Heavy gauge strings will destroy your fingers and make playing extremely hard for beginners, light gauges do not produce the volume and sound you will require, especially with smaller sized guitars, but medium gives the easy of play and great sound, all in one. For a small-sized model, the MC-1 brings the sound that you would not expect. Somehow, Fender has managed to create a great sound and tone with amazing playability by mixing okay material with basic hardware. Honestly, I have no idea how they are doing it but thanks God they are! Although the tonewood might not seem that amazing and top notch on the paper, once you pick it up you will see that the sound is not lacking at all. Most importantly it does not sound “small” which is a big thing for ¾ sized-guitars. Overall, the MC-1 ¾ is a great beginners or travelers guitar that provides all the basic necessities. This model might not have the same sound and durability as a full sized, expensive Fender model but for the price you are giving you are definitely getting a lot more than just a basic instrument that will last you a month or two. The tonewood, although not the top-notch material, complement each other, producing warm sound and great playability. This is a great first step in the guitar playing world, that will also not empty out and destroy your wallet. Click here to find out more about Fender Beginner Acoustic Guitar MC‌-1 ¾ Nylon String. Click here to view more from Best Beginner Classical Guitar.